The HH11B/HH12B series has been upgraded. Please see the new upgraded models, HH11C/HH12C, or contact our Temperature Engineering department. 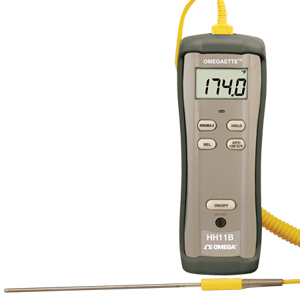 The HH11B and HH12B handheld Omega's digital thermometers feature Type K thermocouple inputs and are available in either single- or dual-input models. The HH11B is a single-input model that has auto range resolution of 0.1 or 1°. The HH12B is a dual-input meter that allows the user to display T1, T2, or øT (T1 - T2) readings with 0.1 or 1° resolution. Both models are °C/°F switchable and feature front-panel offset adjustment and maximum reading/display hold functions. Capable of measuring temperatures from -200 to 1372°C (-328 to 1999°F), these low-cost meters use any subminiature Type K thermocouple. Errors contributed by a particular thermocouple can be practically eliminated, over a limited range, by using the recessed offset adjustment on the face of the meter and an accurate temperature standard. An LED warning light indicates when an open thermocouple input situation exists. Note: Comes with meter, rubber boot, 9 V battery, NIST certificate (no points), appropriate number of beaded wire thermocouples and operator’s manual. HH11B and HH12B accept the standard SMPW-type connectors only. These units are not compatible with NMP connectors.